Painted anemones found on the Hakai Institute docks and in the rocky intertidal areas of Calvert Island. Photos by Jennifer Walker (left), Nathaniel Glickman (top right), and Gillian Harvey (bottom right). This is one of the larger and more common anemones found on the Central Coast. It measures up to 30 cm tall with a column diameter of 20 cm. While it is often blotched with red and green — which gives it the alternate common name of 'Christmas anemone' — its colour is variable, and can be any combination of red, green, yellow, brown, tan, or olive. The blotches look somewhat like paint strokes. The column is dotted with small tubercles,* which give it a roughened appearance. The top of the column has rings of short, stubby tentacles that are usually banded with white and end in blunt white tips. The oral disc is the same colour as the tentacles, but is not striped. This anemone droops across rocks when out of water. *NOTE: the taxonomy of this species appears to be unresolved. 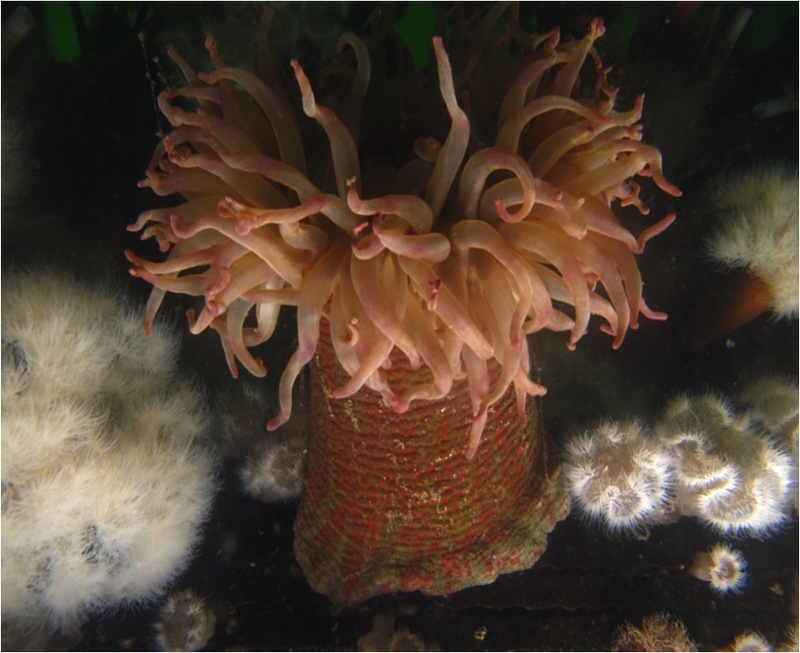 A recent study in the Pacific Northwest found two similar-looking but distinct species often called "painted anemone" and commonly identified as Urticina crassicornis: the true U. crassicornis, which has a smooth body column, and U. grebelnyi, which has non-sticky bumps (known as vesicles or tubercles); however the presence of both these species in the Pacific Northwest is uncertain. 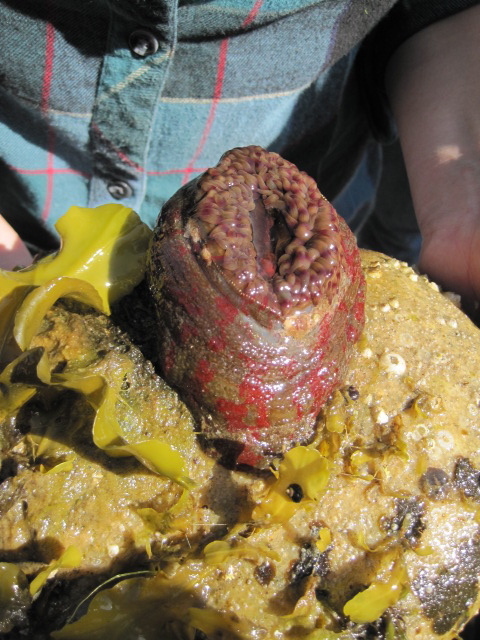 The painted anemone attaches to rocks, docks, and other solid substrates in intertidal and shallow subtidal areas. It may be found hanging from underside of surfaces. This circumpolar species is found along the Atlantic coastlines of Europe and Canada as well as the west coast of North America. Its west coast range stretches from northern Alaska to Monterey, California. 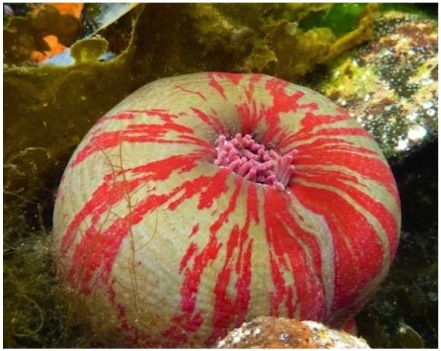 The fish-eating anemone (U. piscivora) is a subtidal species which lacks the banded tentacles of the painted anemone, and is usually a solid red colour. The stubby rose anemone (U. clandestina) has similar tentacles, but because it accumulates sediment around its tubercles it is usually partially buried, whereas the tubercles of the painted anemone do not accumulate sand. Other similar Urticina species have white tubercles. 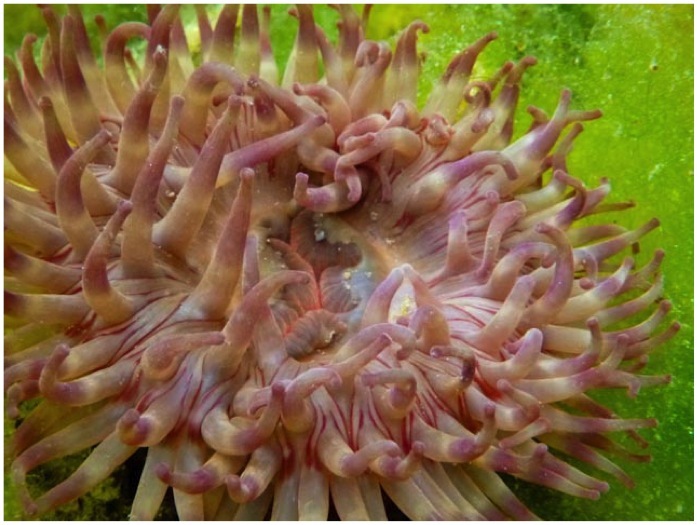 Painted anemones feed on crustaceans, bivalves, other anemones, chitons, fish, and sometimes stranded jellyfish. The candy-striped shrimp has a commensal relationship with the painted anemone - it lives on or around the anemone, gaining protection and food scraps. It appears to be unaffected by the anemone's sting. Cowles, D. (2006). Lebbeus grandimanus (Brazhnikov, 1907). Invertebrates of the Salish Sea. Rosario Beach Marine Laboratory. Accessed 01/08/2013. Cowles, D. (2005). Urticina crassicornis (O. F. Muller, 1776). Invertebrates of the Salish Sea. Rosario Beach Marine Laboratory. Accessed 01/08/2013. Harbo, R. M. (1999). Whelks to whales: Coastal marine life of the Pacific Northwest. Madeira Park, BC: Harbour Publishing. P. 43. Lamb, A., and Hanby, B. (2005). Marine Life of the Pacific Northwest. Madeira Park, BC: Harbour Publishing. P. 83. Sanamyan, N. P. and Sanamyan, K. E. (2006). The genera Urticina and Cribrinopsis (Anthozoa: Actiniaria (from the northwestern Pacific). Journal of Natural History. 40 (7-8): 359-393.